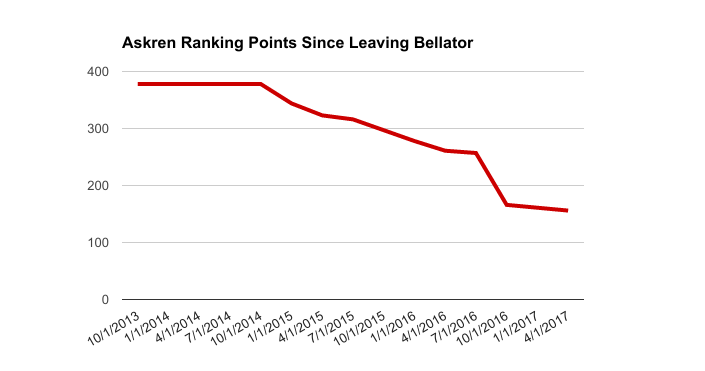 The following chart shows the contemporary, that is at the time, and career-high ranking points of all of Askren’s opponents in Bellator and ONE. 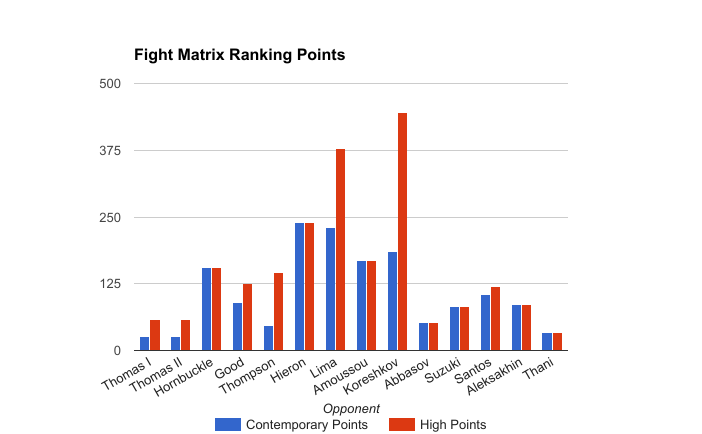 Ranking points are the result of the Fight Matrix statistical model. The more points a fighter has, the higher the fighter is ranked. You can find more information here. As you can see, with the exception of Santos, Askren’s opponents in ONE do not really stack up. On one hand, it is hard to blame Askren for not seeking out tougher competition. For all intents and purposes, he was effectively blackballed by the UFC. By all accounts, he makes a decent living fighting for ONE. On the other hand, he has spent a large part of his prime fighting lesser competition. Since ONE debuted in 2011, they have always brought plenty of sound and fury, but, from a talent acquisition perspective, the noise has signified nothing. Their level of talent remains virtually identical, and they have never been a big player in free agency. Overall, the promotion seems more concerned with generating positive press, expanding into new markets and raking in venture capital like Bitmoji. While this has worked for them in the short term, eventually they will need to either sign high level competitors or develop them from scratch.